news The Australian division of NEC this morning announced it would acquire the Technology Solutions arm of locally listed company CSG for an amount up to $260 million, in a move which will make the Japanese technology giant a significant player in Australia’s IT services market. CSG is a relatively new player on the Australian Stock Exchange, having listed just four years ago in April 2007, an event which cemented the fortunes of its then-managing director and chief executive Denis Mackenzie — to the extent that he was enjoying using a corporate jet for travel around Australia. Headquartered in Darwin, the company provides two main types of technology services – the first being fairly traditional business technology solutions and the second being managed print, voice and data services. CSG has established a strong foothold in the Northern Territory Government, but has also been making its way into Australia’s other states over the past several years, expanding its headcount to about 1500, raising significant amounts of capital and making acquisitions along the way. It is especially strong in the public sector. The company is one of a handful of mid-tier IT services firms publicly listed in Australia – among them SMS Management and Technology, UXC, Oakton and ASG – who have enjoyed relatively stable growth over the past few years, surviving the global financial crisis and the implosion of a small number of similar companies (including, for example, Commander, part of which was bought by CSG) along the way. CSG’s revenues and profits have been growing rapidly since it listed (it brings in annual revenue of close to $390 million). However, the future of CSG is known to have been up in the air for some time. The company revealed in September that it had received a takeover offer from an un-named suitor, which saw shareholders offered a substantial premium on their current holding in the company. In Australia, NEC has operated a number of diverse businesses. It has a number of hardware solutions, ranging from desktop phones to LCD monitors and projectors. In addition, it has a substantial telecommunications services and integration business, traditionally focusing on work with the enterprise end of the markey. In April this year, for example, NEC announced that it had signed a multi-million-dollar three-year network services contract extension with Toyota, which will support the company’s IT operations. It also recently launched a cloud telephony solution. In a statement issued this morning, NEC said the CSG buyout was consistent with its global growth strategy to further develop its ICT services capabilities. “It also strongly supports NEC Australia’s vision of becoming a leading Australian ICT services company and significantly broadens its capability set in high growth services such as ERP, CRM, Business Intelligence, managed services and cloud based business solutions,” the company said. CSG will operate as a stand-alone company within the NEC Group, reporting to the company’s local managing director Alan Hyde. For its own part, CSG said in a separate statement that the deal would be worth up to $260 million (depending on an earn-out payment), and was based on the need to “crystallise value” for its shareholders. The company will use the proceeds from the sale to pay down debt and return capital to its shareholders, with a target date for finalisation of 2 July 2012. From here CSG will focus on its print services division, which will also go through an additional restructure. According to NEC, the buyout will position the company as one of the top tier ICT companies in Australia, by revenue (over $400 million) and employees (approximately 1,550). However, it remains unclear how much of that revenue is derived from NEC’s new and larger IT services business, with CSG in the fold, and how much of it is derived from the company’s existing hardware and other diversified businesses. Additionally, even annual revenue of $400 million will not place NEC in the same league as other major diversified ICT businesses in Australia, with companies such as IBM, for example, pulling in close to $4.5 billion in annual revenues from Australia, and other such as HP not far behind. Fujitsu, CSC and Dimension Data are additionally substantially larger than NEC in Australia. Wow. Suddenly, from being a relative bit player, NEC Australia looks to have vaulted itself into the mid-tier of Australian IT services companies with this acquisition. This is a huge move for the Japanese company, and one that signals a substantial investment in Australia, as well as a substantial re-shaping of the Australian IT services market. Not since Fujitsu bought KAZ several years ago have we seen such a dramatic move in Australia’s IT services category. To my mind, the real story here is not the sale of a large portion of the CSG business, which looks to have been on the cards for a while (it’s far from clear that the two halves of its business, IT services and print services, went well together), but the turnaround of NEC Australia and gradual implementation of a substantial and dramatic strategy by its managing director Alan Hyde. 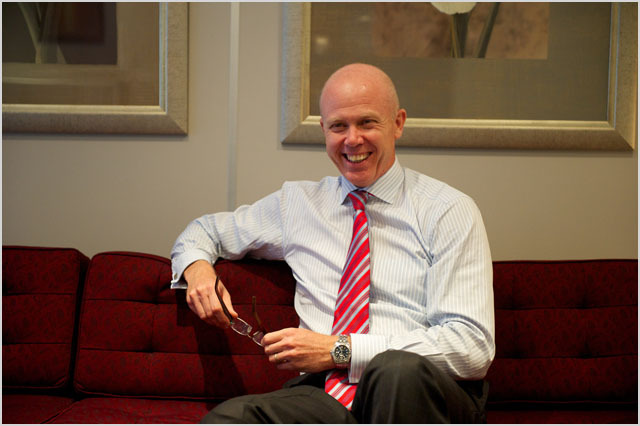 Hyde was appointed in October 2010 to the role as the first non-Japanese head of NEC’s Australian business in its 41 year history operating locally. The well-regarded executive previously led the Australian division of German software giant SAP. It looks like either Hyde went into the role having a strong strategy of local development he wanted to implement at NEC (a ‘fixer-upper’), or was able to persuade the company that it should pursue such a strategy after his appointment. Either way, he has engineered something of a coup for NEC. The company has notably exited its long slumber over the past several years, launching a bevy of new products in several sectors, kicking off a renewed marketing strategy and generally showing a great deal of vigor — of which the CSG buyout is just the latest move. It seems to be that there is a great deal of empire-building going on at NEC Australia right now, and that’s a great thing. Australia’s IT services market has been too stagnant for too long; and it’s great to see Emperor Hyde and his team stirring the pot.